PCRProberTM alkaline phosphatase labeled probe is for amplification and non-radioactive detection of a trinucleotide repeat region amplified PCR product. The PCRProberTM Kit comprises of a primer pair for PCR amplification followed by gel blot and chemiluminescent detection using the alkaline phosphatase oligonucleotide probe. Quantity supplied is sufficient for 100 amplifications. 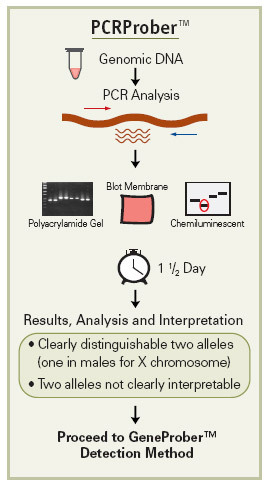 Gene Link&apos;s PCRProberTM Kit is based on PCR amplification followed by Southern blot chemiluminescent detection using an alkaline phosphatase labeled oligonucleotide probe. This kit is a safe and sensitive alternate to radioactive-based detection methods. The amplified products are resolved on a sequencing polyacrylamide gel, and then blotted and processed for chemiluminescent detection. The PCRProberTM Kit is simple and robust for routine triple repeat detection of greater than 100 repeats of all triple repeat disorders listed, except Fragile X. The CGG repeat in Fragile X can be detected up to ~50 repeats. It is strongly recommended that the genotyping be followed up by using GeneProberTM Southern blot detection methods when two alleles are not clearly discernable. Fragile X CGG repeats genotyping results using Gene Link&apos;s PCRProberTM. Various human genomic DNA samples were amplified using the reagents supplied in the PCRProberTM Kit (Catalog No. 40-2004-32) and processed for chemiluminescent detection following the protocol in the manual provided. Fragile X CGG repeat genotyping as an initial screening using the PCRProberTM is rapid as it amplifies CGG repeat sizes up to ~50 repeats. 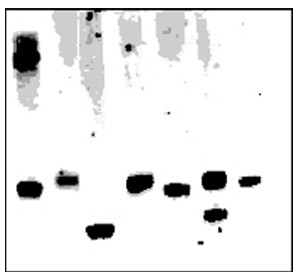 Lane 1 in the blot shows a female sample containing 29 and ~60 CGG repeats respectively.